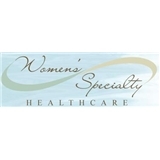 Women’s Specialty Healthcare (Bellaire) - Book Appointment Online! She is such a great doctor! It was quick to be seen and she's very sweet. She personally called me to go over the results, rather than having her nurse do it, which I really appreciated.